The moment you first see Mykonos you will understand this is a place you should take a lot of photographs! You will be amazed with all the wonderful landscapes, the unique architecture, the clean, traditional neighborhoods, the spectacular sunsets and the colorful life of the island. These images are something you can carry back home with you along with your great memories and share with your friends. Make sure you get your best camera with you or an empty storage device to save your photos. You will find yourself taking more photos that you could ever imagine! Although there are many picturesque locations on the island, the following 5 are maybe the best ones. You can start taking pictures at the port or the Windmills or even from your balcony at your Mykonos Luxury Villa, which many of them were built in last decades in the most idyllic and panoramic locations giving the guests the opportunity to take dream photos from amazing landscapes but this will be only the beginning of your great photography adventure! 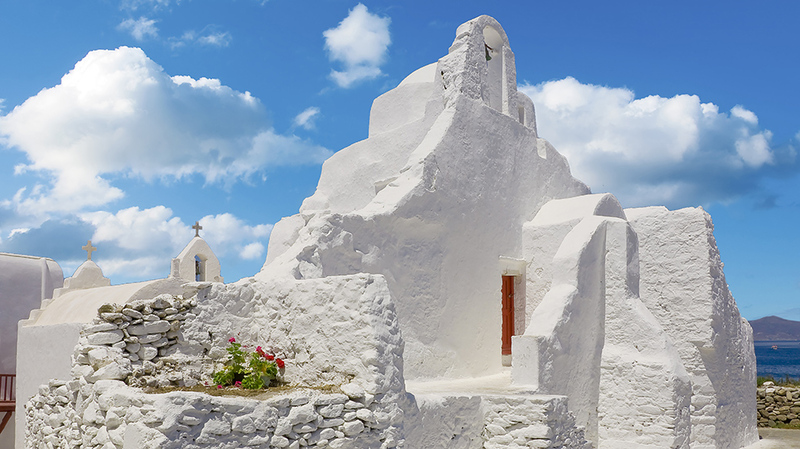 Their Greek name is Kato Myloi and they are all placed on a hill at the south –east of Chora. They form a row of 7 mills, pointing to the ocean. From the 17th to the 19th century, they offered a lot to the local economy, providing passengers with bread and rusk, as Mykonos was a necessary stop for the passing boats. There used to be more than 20 windmills on the island but most of them faded out as they became useless. The best-preserved one is the private windmill of Geronymos, where most of the old equipment is in good condition. 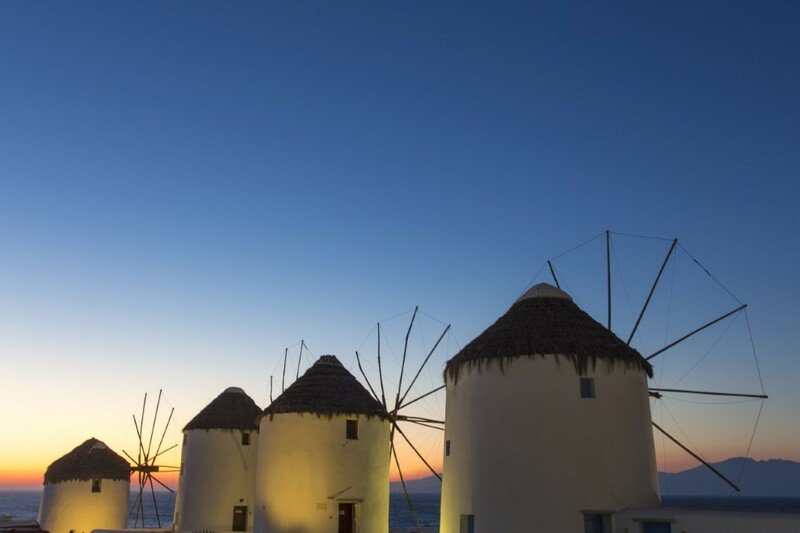 The windmills have become a trademark for Mykonos, as they are the first thing you see if you approach the island by a boat and is one of the most famous places in Mykonos to capture especially during sunset time. Little Venice is a neighborhood with a special architecture that will remind you of Venice in Italy. It is part of Mykonos Town beachfront and the sea leaks the base of its two-story houses. The small wooden balconies are literally hanging above the waves. The houses were built during the 18th century by fishermen of the island. Today most of them have been refurbished into bars, restaurants and cafes. 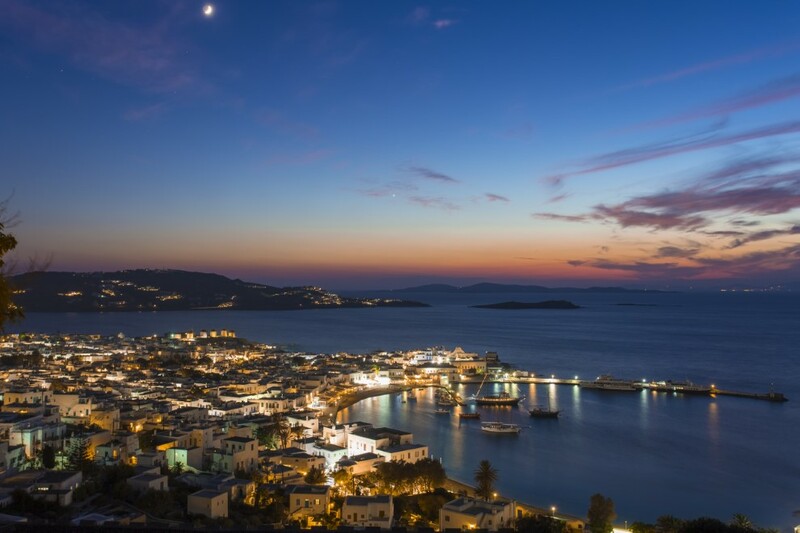 Due to its orientation, Little Venice has a wonderful view to Mykonos sunsets. You will see many tourists enjoying their coffee or cocktail at sunset time, while they watch the amazing colors and take a lot of photos. 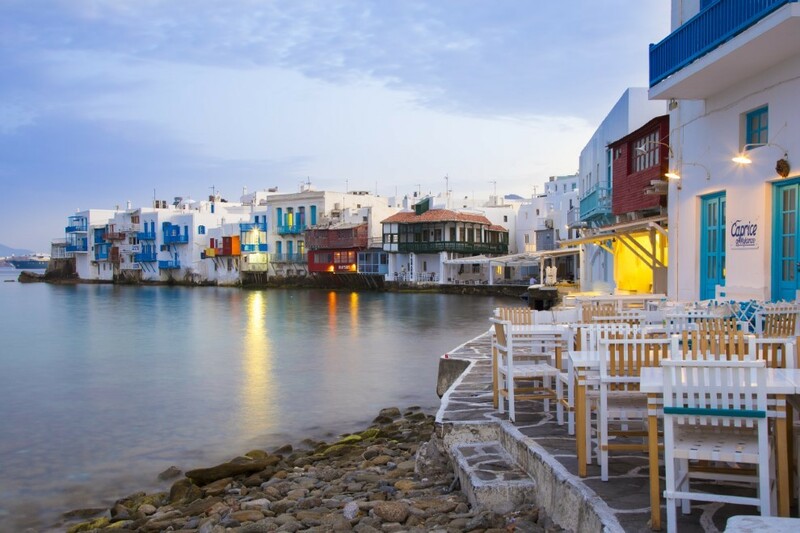 Little Venice is one the most photographed areas of Mykonos. The best time to take good photos of Little Venice is in the morning, when most tourists sleep and the neighborhood is quiet. By afternoon the place becomes crowded and later on it gets rather noisy. This is one of the most famous and very unique churches in Greece. It is located at Kastro area, near the Old Port. Kastro was the medieval Castle of Mykonos which has been destroyed during the centuries. Paraportiani Church is a complex of 5 temples, four of which create the base to hold the 5th one. Each one of the 4 base temples has its own architectural style: Byzantine, traditional, vernacular and western. The construction of the church began during the 15th century and finished 200 years later. If you are brave enough to reach the top of the rocks in front of Paraportiani, you will get the best photos of Mykonos Town and the Aegean sea. The Lighthouse of Armenistis was built in 1891 as a tribute to the rich maritime history of the island and is still fully operating. It has a height of 19 meters and a beautiful octagonal tower. From here you can see many miles into the sea, the nearby island of Tinos and the boats travelling between the two islands. To get there you must take the road to Agios Stefanos and follow the signs to Fanari (this is the Greek word for “Lighthouse”). The distance from Mykonos Town is around 7 km. 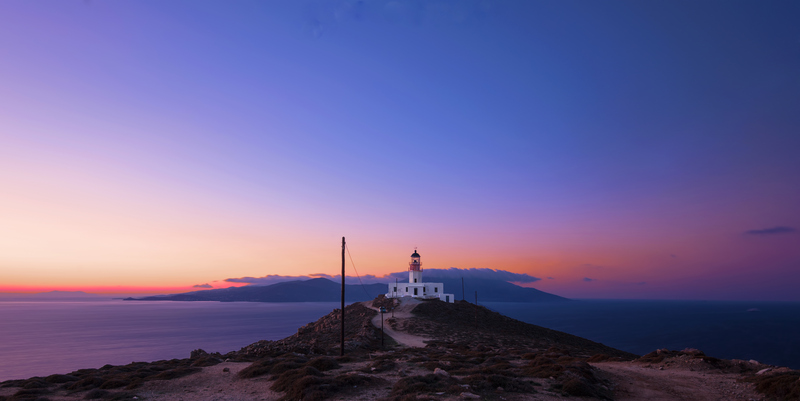 Some Mykonos Luxury Villas have been recently built around the Lighthouse and are available for rent, offering a great accommodation with wonderful panoramic views, isolation and quietness to their guests. It is the perfect location for people who love great views and don’t bother to have some distance from the beach. 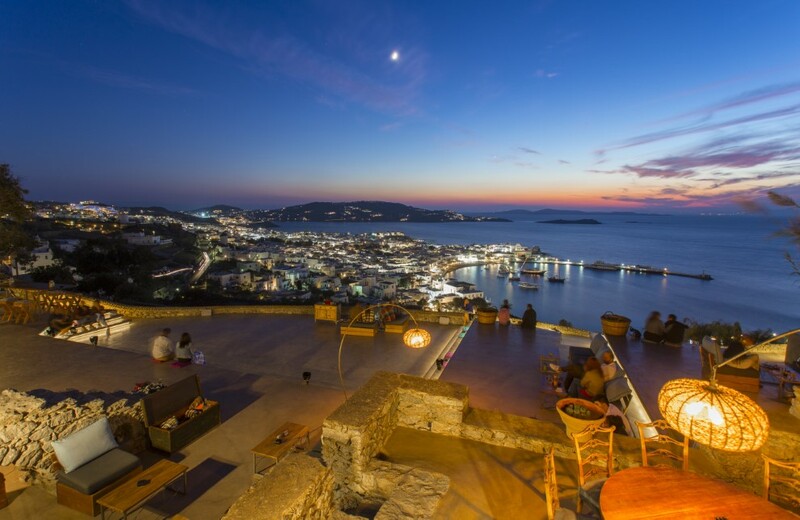 This is a lounge bar just outside Mykonos Town, dedicated to the fascinating Mykonos sunsets. 180 sunset bar operates from early in the evening till midnight. Its perfect location on the top of a hill offers a panoramic view to the city, the ocean and the sacred islet of Delos. From here you can get great pictures of the Windmills, the Old Port and the city’s night lights. The DJ plays chill out music and the bar serves amazing cocktails, spirits and a few gourmet dishes. The bar is simply decorated and designed around the different level verandas. You can sit around a table at comfortable sofas or chairs or you can choose one of the huge pillows that are just thrown on the lower floor. It is recommended that you make a reservation or arrive there early. , which many of them were built in last decades in the most idyllic and panoramic locations giving the guests the opportunity to take dream photos from amazing landscapes but this will be only the beginning of your great photography adventure!